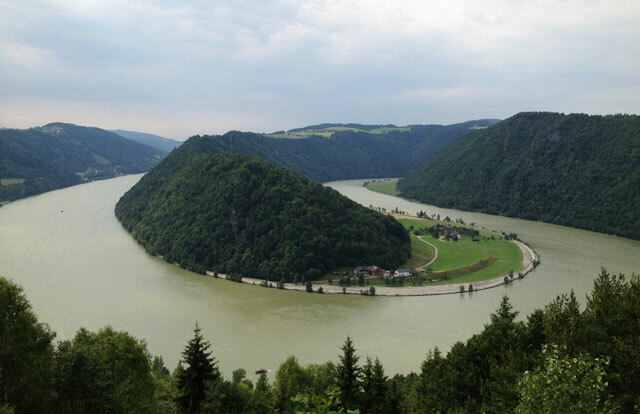 We’re staying at Gasthof Dexler in Niederranna on the Danube close to the S-bend between Linz in Austria and Passau in Germany so are able to start directly from our hotel. It turns out to be one of the highlights of our trip. The sky is blue and it’s 22°C when we leave at 9.30 after saying goodbye to the Aussie cyclists. 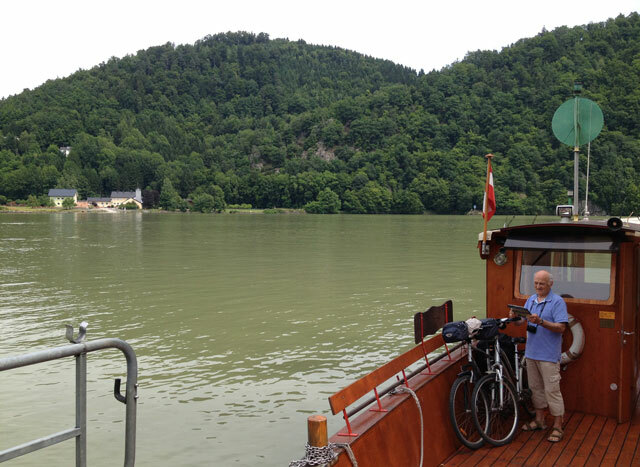 We come to the end of our shady cycle path at Au and take a little ferry across to Schlogen. 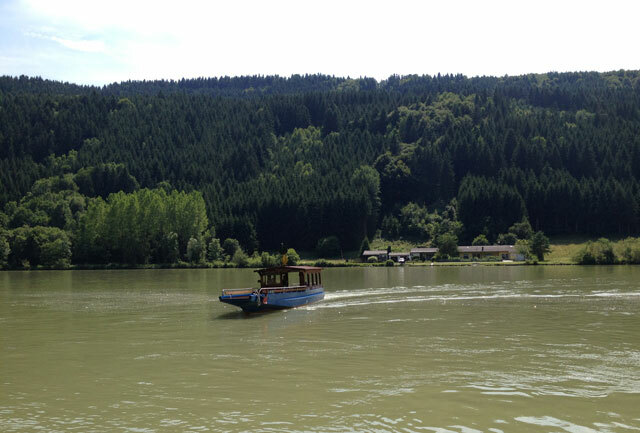 We cycle towards the second bend at Inzoll and take a rest stop at Gasthof Steindl and watch the river traffic. 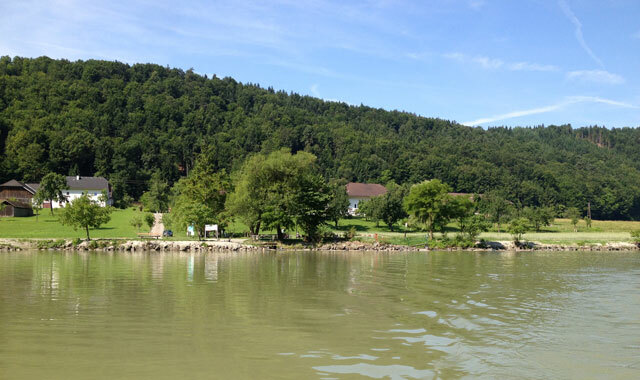 We continue on until we are opposite Untermühl. It’s wonderfully quiet and peaceful with no cars. However, by now I’m severely bitten by mosquitos because I’ve stupidly forgotten to use spray and although the little waterfalls along the way might be cute they’re a great breeding ground. 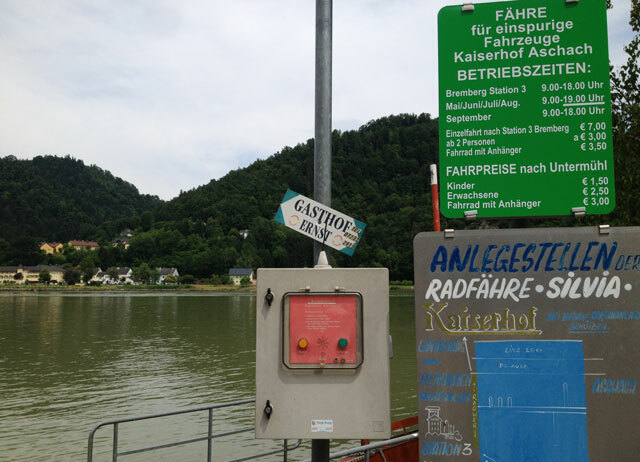 We locate the ferry opposite Untermühl, but there is no sign of a ferryman so I go to a nearby gasthof where I am told in German with appropriate handsigns that I have to press the button on the intercom near the ferry. Fortunately a young German couple who speak English have arrived by then and are able to interpret the message that the ferryman will be there in 10 minutes. He soon turns up on his little tractor, jumps into the ferry and takes us across while Jean Michel studies the next part of the trip. 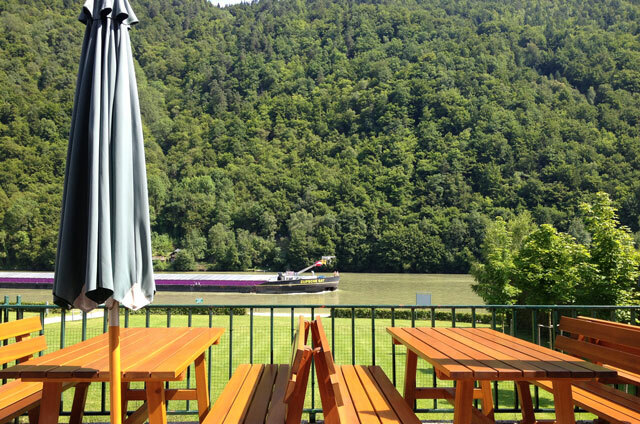 From Untermühl, we cycle back to Obermühl crossing a couple of rivers on the way and have the most delicious wiener schnitzel and a very cold glass of riesling on a shady terrace overlooking the Danube. By the time we get there, it’s 2.45. 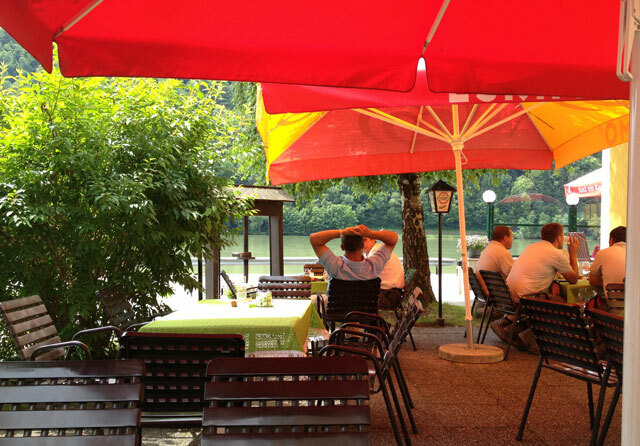 I just love the way they serve meals all day in Germany and Austria! With renewed courage, we continue on to Steinbruch where we are to take another ferry which is already halfway across the Danube. 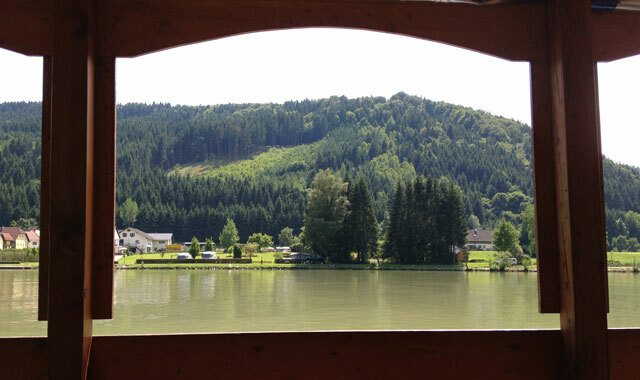 An Austrian couple waiting to go in the other direction (Aschach) tells us in English to call the ferryman on the intercom so he can come back and get us. I ask the man if he would mind doing it for us as I am afraid of not being understood. 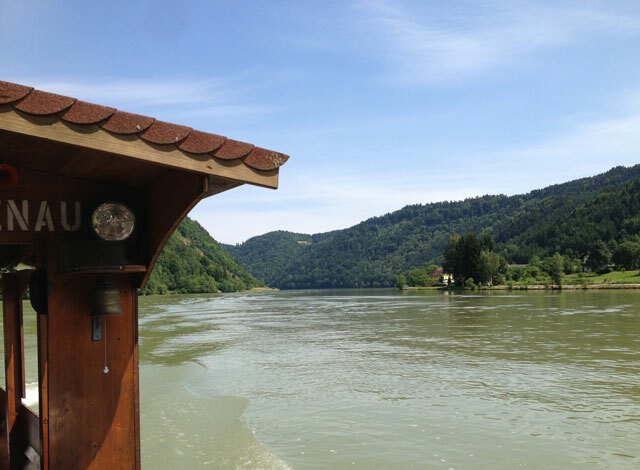 This time, the ferry is bigger and our trip back up the river takes about 20 minutes – a little mini-cruise in the middle of the Danube. 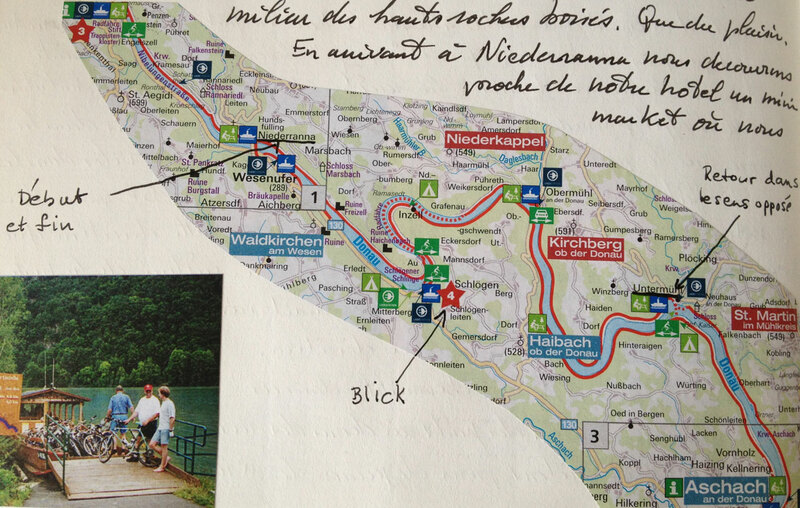 We get out at Au and cycle back to our hotel, a total of 59 kilometers and a cycling time of 3 ½ hours. My knees are feeling a little wobbly! It’s only 4.30 so Jean Michel suggests we go up to a blick (lookout) near Schlogen and get a bird’s eye view of the loop we have just ridden. 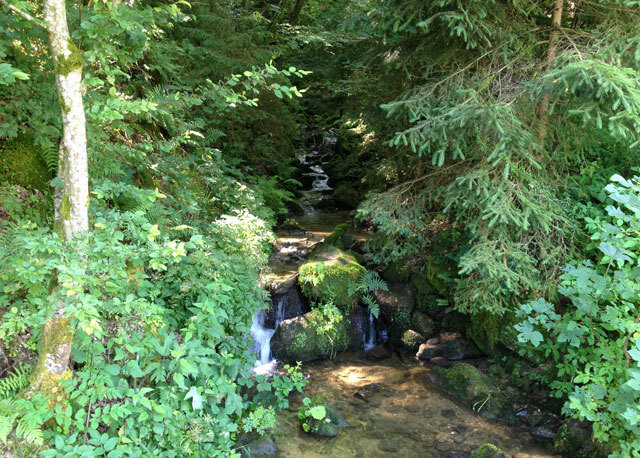 We park the car and walk through the forest for about a quart of an hour before we reach the blick. The view is absolutely stunning. When we get back to the car the sky is threatening and we can only spend a few minutes on the terrace before the rain starts. I have the brilliant idea of taking the table and chairs into the room so we enjoy our apéritif watching the rain and reminiscing over our truly exceptional day. 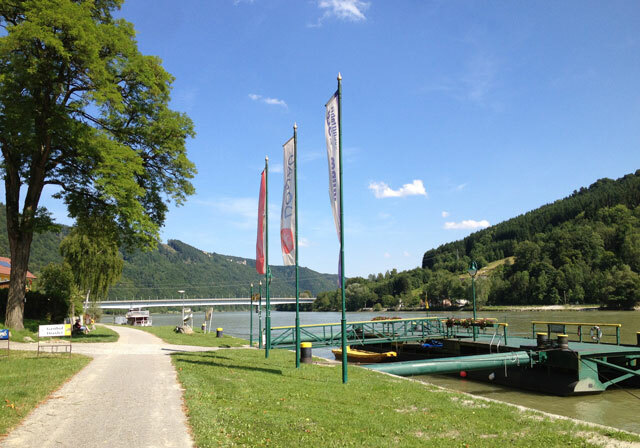 This entry was posted in Accommodation, Austria, Cycling, Restaurants, Sightseeing and tagged cycling, danube, S-bend in Austria, Schlogen. Bookmark the permalink. Hi, Lyn. I’m glad you’ve been enjoying our holiday. I’m so sad it’s finished! If 20 kilometers is comfortable now, you’ll be more than proficient in 13 months’ time. How are you doing with those hills? What sort of bike did you finally get? Looks like a cool place. I love the last photo of the s-bend. There is a similar photo in our inspirational book so we were determined to reproduce it ourselves! I’m impressed with how much cycling you’ve been doing! Like Andrea, I love that last photo of the S-bend – fantastic.